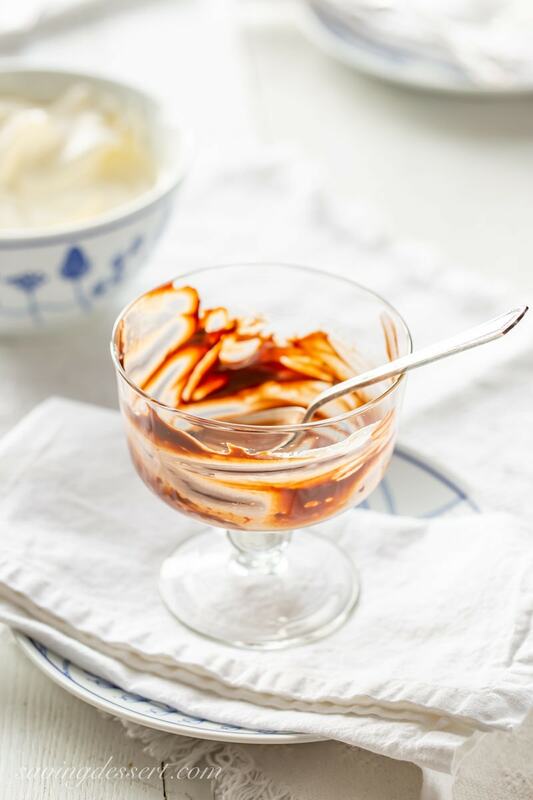 Do you remember the last time you had a bowl of rich, creamy Chocolate Pudding? I’m not talking about the stuff that comes in the box, which really does have a small place in the corner of my heart. 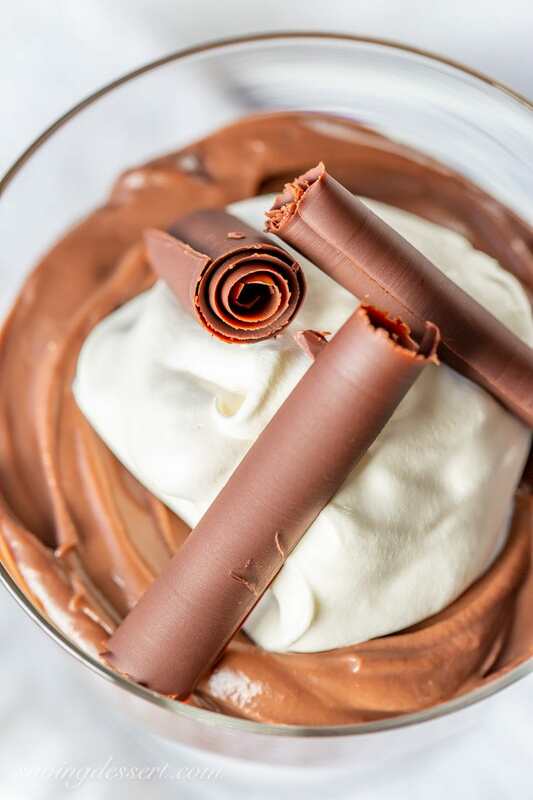 I’m talking about a chocolatey, decadent and velvety smooth, rich Chocolate Pudding Recipe that will practically make you swoon! If you haven’t tried making and eating homemade pudding, this is a must make recipe! It’s very easy to make, cooks up in about 15 minutes and keeps well in the refrigerator for several days. We’re still blessed with monthly family dinners at our house with the kids, their spouses and the three little ones too. 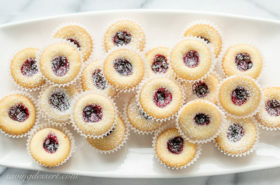 It’s times like those that I love a make ahead dessert most of all! Dinner for nine is always a challenge mostly due to the wide age range – from grandparents to grandchildren, and not everybody will eat the same foods. However, I bet you won’t have a problem getting the entire family to eat chocolate pudding! 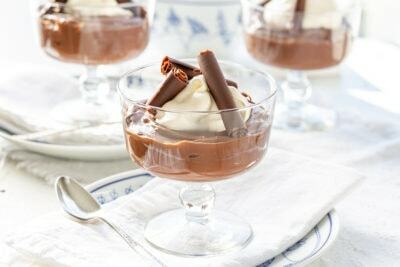 Dress up this simple Chocolate Pudding Recipe with a dollop of sweetened whipped cream and a few chocolate curls. Kids will feel very special when they get a pretty glass filled with chocolate pudding of their very own! 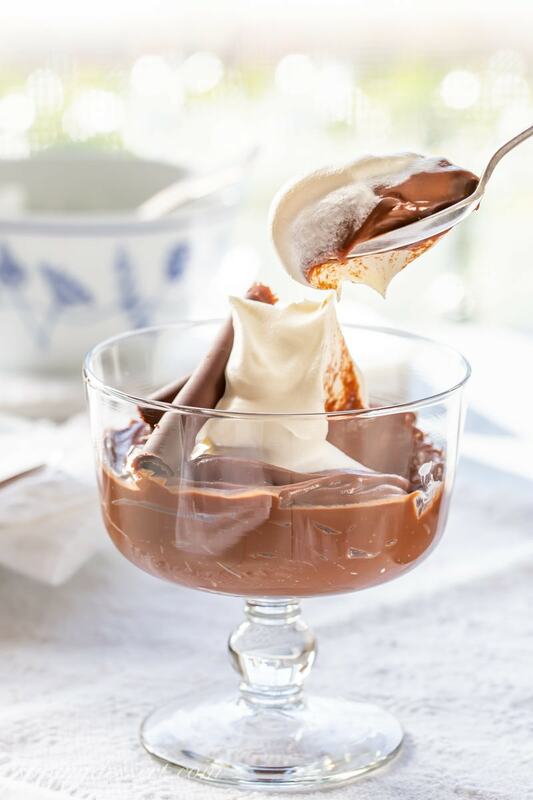 Adding a simple garnish of chocolate curls makes this easy luscious dessert appear fancy-schmancy. Chocolate curls are a great garnish for everything from cakes, to pies, and even a simple bowl of pudding. I love the extra pretty touch they add, and they also taste wonderful. I use semisweet good quality chocolate and follow the directions found HERE on The Pioneer Woman for easy chocolate curls. 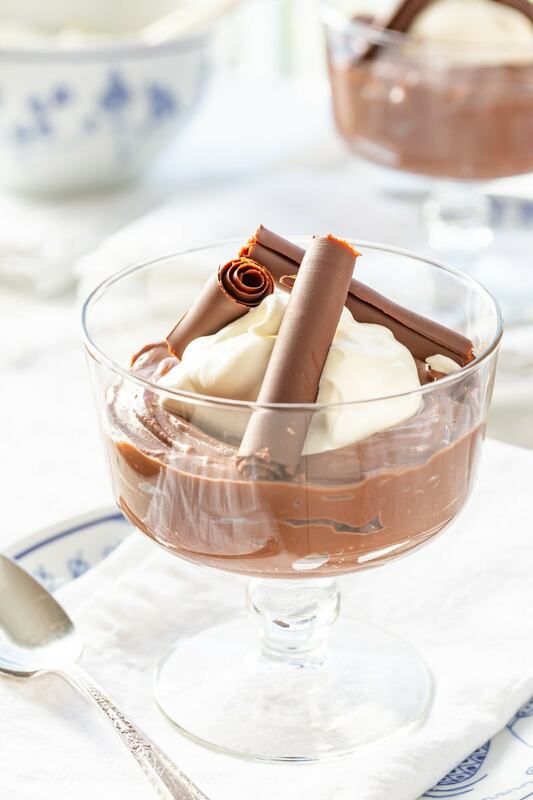 While I love making this Chocolate Pudding Recipe ahead of time and chilling until ready to serve, eating warm pudding is something you must try, and won’t soon forget. Warm pudding almost has a different flavor than chilled pudding, with each being terrific in their own way. Puddings make great anytime desserts. 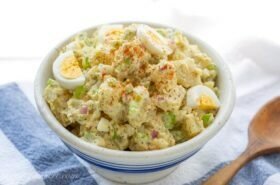 We have several terrific and easy recipes posted here at SRFD you might like! Check out this classic Banana Pudding made with fresh bananas and vanilla wafers topped with a toasted meringue. 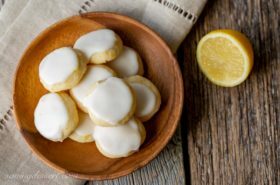 It’s a southern classic and beloved by many as their favorite dessert of all time. Click HERE to get the recipe for Banana Pudding. For a terrific grown-up treat try our Butterscotch-Bourbon Pudding. This is an easy, make-ahead creamy pudding spiked with bourbon and topped with sweetened cream and crushed ginger snap cookies. Butterscotch and bourbon are the perfect pair! Click HERE to get the complete recipe for Butterscotch-Bourbon Pudding. 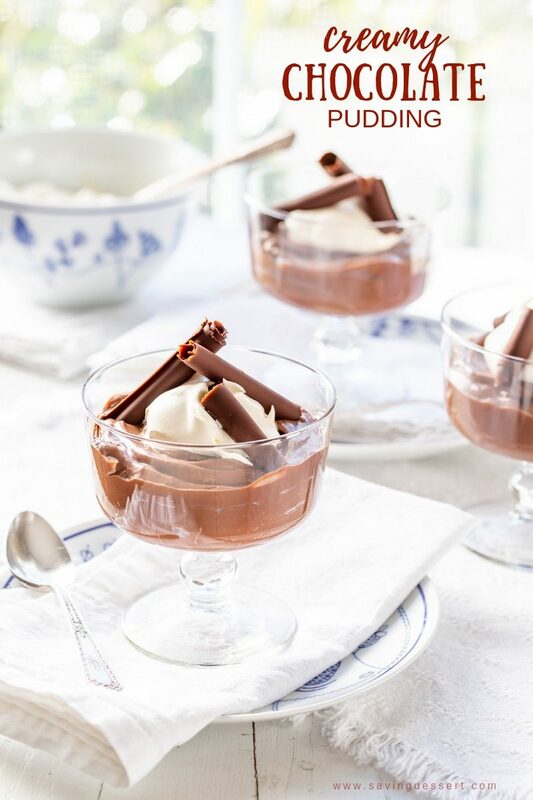 Easy to make and easy to eat, our rich and creamy Chocolate Pudding Recipe is a winner for any occasion! In a small bowl combine the vanilla and espresso powder. Set aside. In a medium mixing bowl lightly whisk the eggs yolks. Set aside. Set a large sieve over a large bowl and set aside. In a large saucepan combine the sugar, cocoa, salt and cornstarch. Stir milk in gradually with a wooden spoon. Cook over medium heat, stirring constantly until mixture thickens and boils. Boil 1 minute, stirring constantly. Remove from heat and add the chopped chocolate. Stir until melted taking care to get into the corners of the pan. Slowly drizzle half the chocolate mixture into the yolks while whisking the eggs constantly. This slowly warms the eggs without cooking them into scrambled eggs. Blend the chocolate and egg mixture back into the saucepan with the remaining hot mixture and mix well. Return to the heat and boil 1 minute more, stirring constantly. Remove from the heat and add the butter and vanilla/espresso mixture. Pour the pudding through a strainer into the prepared bowl, if desired, to remove any lumps of egg or cornstarch. Immediately press a piece of lightly greased (vegetable spray) parchment, plastic wrap or wax paper directly onto the surface of the pudding. Refrigerate for 4 hours. When ready to serve, spoon into serving glasses and top with lightly sweetened whipped cream and chocolate shavings or curls if desired. 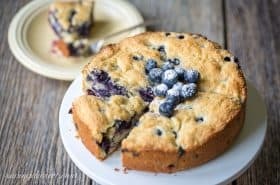 If you prefer to serve slightly warm pudding, pour into individual serving dishes instead of the large bowl and allow to cool slightly. 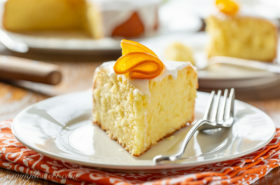 Top with lightly sweetened whipped cream before serving, if desired. Previous Post: The Game Day Edition – Appetizers and Dessert! This pudding is unbelievable! Silky and chocolate-y. A keeper for sure. Topped it off with fresh whipped cream! Can’t wait for hubby to try it. Thanks Cheryl! Hope you had a spoon or two while it was still warm – so good! Hope your husband loved it too. And most of all, thanks for trying our recipe and for taking the time to comment! You are making me hungry! Pudding from the box strikes a chord with me too. It was often dessert with Cool Whip on top when we were kids. But yours? I want that now! The dessert of choice for little kids was always chocolate pudding. Such a treat 🙂 Thanks Abbe! My husband would be happy if I’d make him chocolate pudding every week for the rest of his life! Your recipe looks perfect!!! Thank you John – hope you’ll give it a try. Thanks ladies – such a delicious treat for sure! This would be a huge hit here, Tricia! It looks scrumptious! Haven’t made pudding in ages and Bill would love it for sure. Thanks for the recipe! These chocolate puddings look out of this world! Gorgeous shots, Tricia. Thank you Angie! Such a delicious treat. I’ve never seen chocolate pudding look so good. I would probably be licking the bowl clean! I adore pudding, we ate it all the time as kids, and yours looks so SILKY! We always had pudding after our Sunday meal in Germany. My father’s favorite was chocolate pudding. Yours looks delicious and comforting Tricia. Have a great week. I love that food memory Gerlinde. Sunday suppers are sadly missed in todays society. No I don’t remember, so I’m obviously long over-due for a beautiful bowl of this luscious pudding 🙂 Thanks for reminding me! Looks delicious Tricia. I love real chocolate pudding but haven’t had it in years. Mom made it and my favorite dessert was when she poured it into one of her awesome pie crusts.